Ready to manage your business in more than one dimension with the industry's best clothing store POS system? Springboard Retail cloud-based Point of Sale is designed with features specifically for growing apparel stores. See inventory details across all your channels. View items in the same family across different attributes (colors, sizes, and more) with customizable, multi-dimensional grids. Transfer between stores, create purchase orders and so much more! Springboard Retail apparel POS software lets you create custom fields and report on what matters most to you. Access detailed, real-time reports on sales, inventory and customers from anywhere. Save time and money by making data-driven decisions. Our Quickview customer dashboard allows you to see a client's units per transaction, personal preferences, sales history, and more. Make informed recommendations and drive sales. Create targeted marketing campaigns by grouping customer types. "We love Springboard Retail's ability to help us manage inventory and meet customer requests, and quickly identify our best selling merchandise to design the store for maximum revenue potential." Springboard Retail's omnichannel POS system for retail clothing stores was developed by from the ground up to provide enterprise-grade features for growing retailers. Inventory management, customer management, robust reporting – all in real time and accessible from anywhere on any device. Train your team quickly with our intuitive interface and empower them to sell more! Using Shopify, BigCommerce, or Magento? We have top retail platform integrations. With our coupon and promotion features you can increase sales and loyalty. 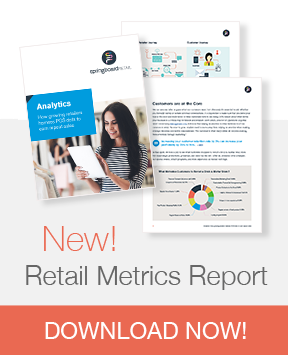 Gather custom data and use our reports to make strategic and profitable decisions. We’ll support you every step of the way. Our QuickStart package is designed to get you up and running quickly. Our customer success team, staffed with retail consultants, will help you create a go-live plan, configure your account, and train your employees. Use our Help Center for knowledge base articles and know that we're always standing by to help you succeed. Ready to see why Springboard Retail is regarded as the best POS system for clothing stores? Read our apparel store report on "Personalization & the Customer Experience"